Terrific recent photo of Pink Flat by Jane Nicholls. I’m re-watching the Close Up episode about Scarfie flats that aired last night. There’s a very quick pan past Pink Flat the Door, 3 Clyde Street, which was recently sold, and it appears the door has been painted over (horrified gasp). Can anyone on the ground confirm? This is one of the songs mentioned in Graeme Downes’s article referenced in an earlier blog post about the “It’s time to go flat” on Clyde Street. 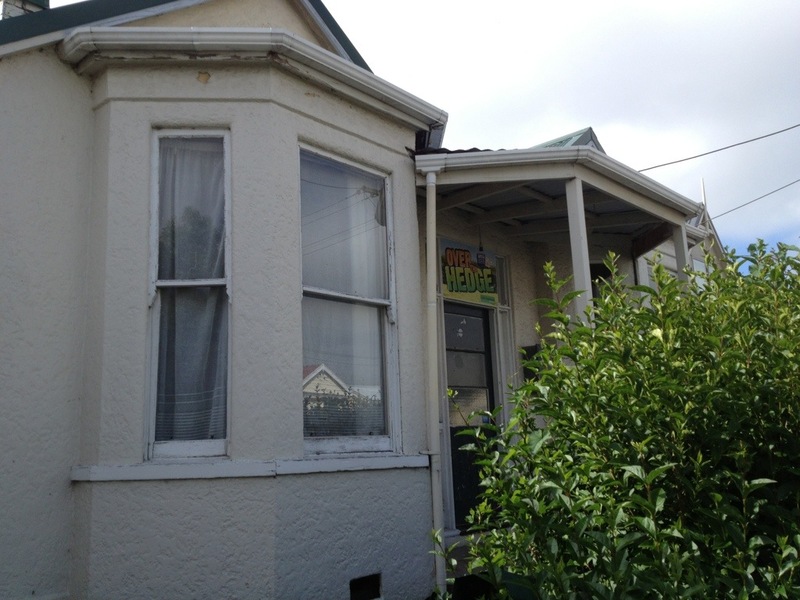 85 Clyde Street, Tui’s Tavern, was named by Gene Graham for the flat cat who in turn was named for Tui Takeaways, a long standing provider of a greasy package of ‘chips and stuff’ for many generations of students at Otago. Gene remembers the sign was “made with spray paint and a stencil and a box of double brown”. 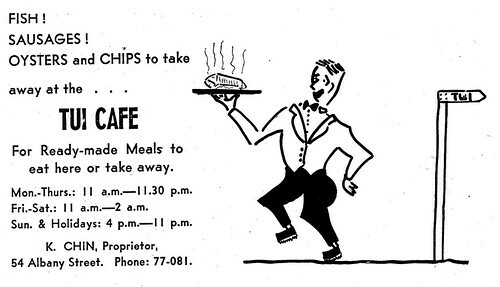 Tui’s takeaway at 20 Malcolm Street (the current site of a cafe, Food Department), for many Scarfie’s past, was a scene of sustenance, refuge, ‘spacies’ and trivia on the way home from a night out on the town – or a few jugs at The Cook. After serving generations of students at all hours, Tui closed it doors in December 2005. Kum Yuen “Kim” Chin, a.k.a. 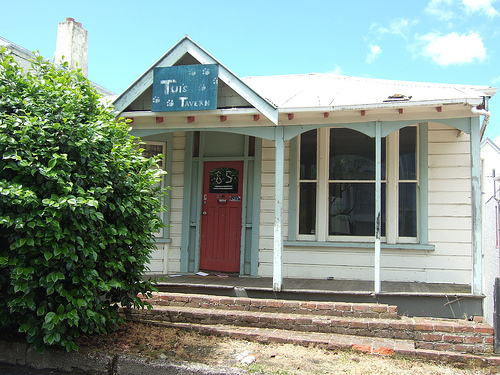 Mr Tui (Snr), ran the Tui Cafe from the 1950s-1970s at it’s location at 54 Albany Street. His son, Mr Tui (Jnr) took up the apron later on. Mr Tui (Jnr?) is remembered for delivering large quantities of ‘chips and stuff ’ to parties in the student ghetto. The stuff being an assortment of deep fried goods – the more memorable being potato patties (‘just big chips’) and ‘random fritters with peas and stuff’. He’s also fondly remembered for his trivia questions. Roi Colbert, writer, commentator on music and anything he feels like, and ex-proprietor of Records Records, reflects on Orientation Week and recalls unflattering memories of Tui Takeaways. The OUSA Fish N Chip Review which was initiated in 2000, reported on nine different establishments in 2005. Gruesome descriptions of the age of the oil used wouldn’t entice me back, even if the place was still open – even for a game of Devastators or Mortal Kombat. Needless to say,Tui didn’t win the cup. After Kim Chin’s death in 2002 an obituary was published in the University of Otago Magazine, ‘Remembering Jo Tui” University of Otago Magazine, Issue 3, October 2002, 40-41. A story on ghetto flats in Dunedin directed by Justin Hawkes for New Zealand TV Show ‘Space’ way back in 2003. It shows some pretty grotty flats, the important thing is that some of them are named; Hilton on Clyde and DSIR. 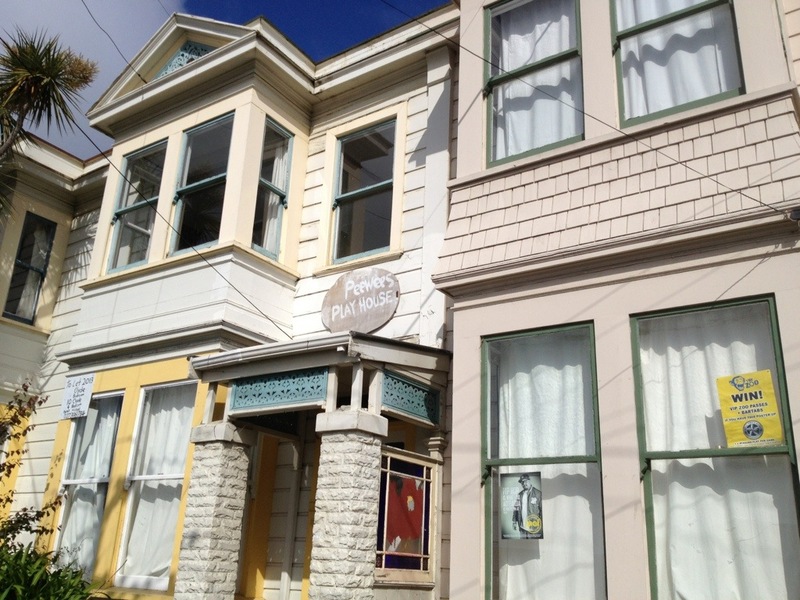 A house at 111 Clyde Street, next to Footrot Flats, on which fans of The Clean painted the lyrics of “Sad Eyed Lady”. The flat came to be known, according to Graeme Downes, as the “It’s time to go” flat, after the final line in the song. Great photo here of a bit of Clean graffiti by Allisonwonderlandz on flickr.com.